Daniel Portas was born in Meaño, Pontevedra, in 1976. He began his musical studies at age ten at the School of Music of the Band Musical Union. 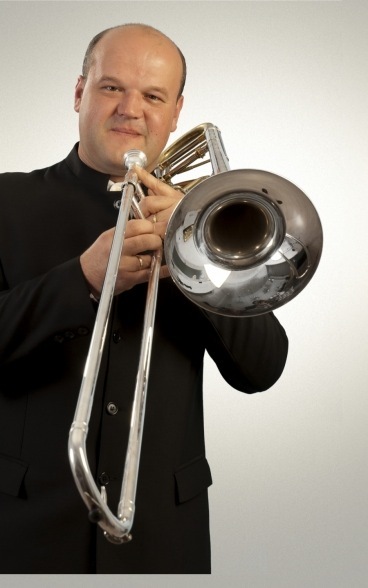 In 1995, he joined as Trombone Soloist the Municipal Band of Pontevedra. He finished his studies of Intermediate and Advanced Level with Honor Award. In 1997 he joined the Youth Orchestra of Galicia. In January 2003, he received the 3rd prize for Young Performers Contest organized by the Bands Federation of Vigo. He studied trombone with teachers such as Luis Juncal Piñeiro, Jesús Juan de Oriola, Juan Carlos Igea, Indalecio Bonet, Joaquín Vicedo Davó, Feliciano Morales Monteagudo, Ricardo Casero, Michel Becquet, Ruben Prades, Petur Eiriksson, Alberto Urretxo, Unai Urrecho, Francisco Rosario, Christian Lindberg, Jay Friedman, Rex Martin, Scott Hartmann, Ingemar Roos, Håkan Björkman and Weston Sprott among others. He has been conducted by prestigious Maestros such as Juanjo Mena, Pedro Halfter, Maximino Zumalave, Antoni Ros Marbá, Jesús López Cobos, William Costello, Yoav Talmi, John Nechsling, Paul Daniel, Aldo Ceccato, Jan Cober, José Rafael Pascual-Villaplana, etc. He attended Conduction Workshops with professors Jan Cober, Marcel Van Bree, José Rafael Pascual-Villaplana and Unai Urretxo. He collaborates with various Spanish orchestras such as the Symphony Orchestra of Castilla and Leon, Bilbao Symphony Orchestra, National Orchestra of Spain, Granada City Orchestra, Royal Philharmonic Orchestra of Galicia, etc. Currently, he is Principal Trombone of the Municipal Band of Santiago de Compostela and Conductor of the Municipal Band of Caldas de Reis.